Posted on 9th December 2016 at 1:54 pm. They say tall oaks from little acorns grow, and on Sunday the 9th of December 2001 the seeds of today’s grid were sown. On that day, four sites across Europe connected their resources to form the very first grid testbed. Over the next decade and a half this proto-grid would ultimately grow to become the global infrastructure of over 400 sites that we know today. Even at this early stage the UK played a major role with two of those pioneering sites being from GridPP. The idea of a computational grid as envisaged by Foster and Kesselman in their book “Grid: Blueprint for a New Computing Infrastructure” is on the face of it very simple. A grid should enable access to distributed remote computational resources when needed by the user. Back in 2001, however, it was proving to not be as easy as it sounded. Various projects and institutes had started the work of creating a system which would allow users from across the world access to the computing resources they needed without the hassle of negotiating deals with individual providers or even choosing what resources to use. “We had actually done a lot in a very short period of time. GridPP had gone from a plan for a proposal in December 2000 to a fully funded infrastructure project, within less than a year. And we were about to make the first big step towards a proper grid”. The single computer providing the Manchester grid site in 2001. 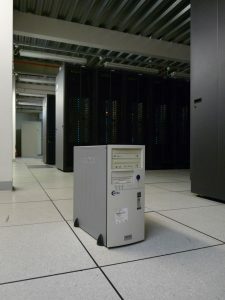 In the background are the 40 racks of 1000 computers which had replaced it by 2005. That step was pretty big though; they needed two very important components: an information system and a resource broker. By monitoring the state of the resources on the infrastructure, and taking into account a user’s requirements, these would allow a user to submit jobs “into the grid” and have them automatically routed to a suitable site. By early December the first versions of these tools were available, and over the weekend of the 8th and 9th of December CERN, the CNAF site at Bologna, the University of Manchester, and the Rutherford Appleton Laboratory in Oxfordshire had installed the software. By the Monday morning they had created the first international grid infrastructure and on the Tuesday it was officially announced at an EDG meeting that the testbed was up and running with the four sites. It wasn’t long before they had company with CC-IN2P3 in Lyon and NIKHEF in Amsterdam joining them within a week. They were pretty humble beginnings. The entire system only consisted of fourteen machines, and Manchester’s entire cluster was run on a single machine (as pictured). Andrew McNab (Uni. Manchester) was part of the integration team involved in the work. In the intervening decade and a half, the grid has become indispensable to many communities. The LHC experiments would be lost without the 200,000 machines they can access to do their analysis. However it evolves in the future, the grid is able to look forward to continue supporting researchers from across the globe and in numerous disciplines.